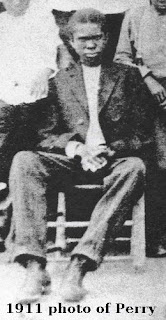 Aaron Perry was a Union County slave who followed his owner into the Confederate Army during the Civil War. For more than 80 years, Perry's grave in a tiny Marshville church cemetery sat unmarked save for a few bricks over it. Now the site sports a granite marker that identifies when Perry was born and died, 1840-March 14, 1930, and the unit he served, 37th N.C. Regiment. Behind the marker sits a shining Confederate Cross of Honor from the Sons of Confederate Veterans.